Frank Orrall kindly gave his permission to publish his song on our site. The American music group Poi Dog Pondering plays alternative rock. The band was founded in Hawaii in 1985, then they moved to Austin and later to Chicago. The line-up of the group fluctuates frequently, but Frank Orrall, Susan Voelz, Dave Max Crawford and John Nelson are in the band from the beginning. 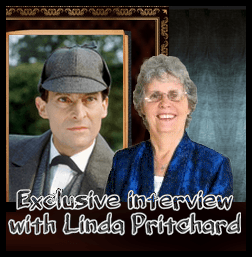 "I am very fond of Jeremy Brett's portrayal of Sherlock, for me, it is the very best. He brought a humanity and Dandy-ism to the Character. That having been said, I think Benedict Cumberbatch also did a wonderful job interpreting Sherlock in the 21st Century." The original title is Jeremy Brett, but Jeremy's fans love to say: "I'm in love with Jeremy Brett song". I'm in love with Jeremy Brett. He was the single greatest Sherlock Holmes. Yet! I used to watch him here on a & e.
Hair slicked back and impecably dressed. His only prop could be a single cigarette. who took the stage intent to fully become his part. a bon vivant filled with bouts of depression. in a cabretta with a floral scarf. London's yours, man! You got Macbeth tonight. A scull in your hands in the fire light. A cab across town and a kiss goodnight. richly complex & brilliantly detailed. to stave his addiction to a certain solution. played it perfect as his friend and companion. A kind hearted, affable Watson. any case that Holmes would command him. I always felt Holmes couldn't do with out him. all the grief triggered manic depression. Could see it in his face - that he was heavily grieving. His heart grew thin and finally stopped beating.